Further to my response to the Hon Member for Carmarthen West and South Pembrokeshire (Simon Hart) at Defra Questions on 25 October (Hansard Ref, Col. 1064) and my Hon. 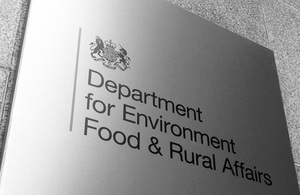 Friend, the Minister of State for Environment, Food and Rural Affairs’ (David Heath), response to an Urgent Question on 29 October (Hansard ref, Col 24 31), I would like to update the House on the Ash dieback situation in the UK. Following a shortened consultation, I imposed an import ban and strict movement restrictions on ash on 29 October. Chalara fraxinea was first confirmed in imported stock in a nursery on 7 March. We initiated an exercise to trace young ash saplings from infected imported stock. This exercise continues. However, we found the disease in mature trees in East Anglia on 22 October. Further searches revealed more cases already present in the wider environment. In response to this I initiated an unprecedented survey of the whole of the UK, in partnership with the Devolved Administrations, to map the extent of the disease. This has involved over 500 staff and volunteers looking for signs of the disease in around 2,500 10 kilometre squares. Four wooded sites were inspected in each square giving us a preliminary indication of the disease’s extent and distribution. That work was completed on 7 November. The results of the survey show that, as of yesterday, there are 129 confirmed sites with ash dieback caused by the fungus Chalara fraxinea. 15 of these are in nursery stock, 50 are in recently planted sites, and 64 are in the wider environment. To date no evidence of ash dieback has been found in Northern Ireland. In addition, the Country Land and Business Association and a number of other organisations have mobilised their members to provide additional information on suspected cases. Regular updates, including the map of confirmed disease in Great Britain, and information for the public can be found on the Forestry Commission’s website (http://www.forestry.gov.uk/chalara). On 7 November I held a summit of more than 100 experts from the forestry industry and environmental groups to advise me on how we can best tackle this disease. This provided an opportunity to share the latest evidence and the current state of our scientific knowledge. The summit also identified ideas for tackling Chalara in the short term and for improving our approach to dealing with threats to tree health in the longer term. The evidence from the survey and the experts gathered together on Wednesday indicates that the Chalara infection has been present in the natural environment in Great Britain for some years. Also on the 7 November, we published an evidence summary compiled over the past week by a group of experts convened by Defra’s Chief Scientific Adviser, Professor Ian Boyd. The scientific advice from that group is that where the disease is present in the natural environment, this is likely to be due to spores blown in on the wind from continental Europe. Their advice is that it will not be possible to eradicate Chalara. That does not necessarily mean the end of the British ash. If we can slow the spread of the disease, this will give us time to investigate resistance to Chalara in the UK tree population. In the longer term, we will also need to consider how best to restructure our woodlands to improve their resilience. I provided a copy of the evidence summary to all Hon. Members on Wednesday and I will also place it in the Libraries of the House. I am today announcing a series of short-term actions to begin to address the problem quickly. Newly-planted diseased trees and diseased trees in nurseries will be traced and destroyed, as once young trees are infected they succumb quickly. Mature trees will not currently be removed, as they are valuable to wildlife, take longer to die and can help us learn more about genetic strains that might be resistant to the disease. Infection does not occur directly from tree to tree. Better understanding of the disease will be built through research and surveys, which will look not only for diseased trees but for those that show signs of resistance to Chalara, to help identify genetic strains resistant to the disease. The search for the disease will include trees in towns and cities as well as the countryside, building partnerships with a range of organisations beyond Government. Foresters, land managers, environmental groups and the public will be informed about how to identify diseased trees and those likely to be resistant to the disease, and know what to do if they find a diseased tree. For now, the main control measure is the ban on imports and movements. Infection in mature trees is not a threat at this time of year as they are not producing spores. The main risk to manage between now and the spring is the movement of infected ash leaf litter for which we have already provided advice to the public, local authorities and landowners. • Designating protected zones, to free up trade in ash from areas free of the disease through authorising businesses to issue “plant passports”. • Establishing a tree health early warning network to provide advice, screening and initial diagnostics. • Developing advice on protecting saplings and responding rapidly if the disease is found. • Developing advice on sustainable management of mature trees on sites affected by Chalara. • What additional equipment is needed to diagnose tree disease. • More public engagement in helping diagnose and tackle disease through “citizen science” including an OPAL (Open Air Laboratories) citizen science project. For the longer term, I am also considering our strategic approach to the threat of disease to our plants and trees in the light of experience of responding to Chalara. In early October, I asked Professor Ian Boyd to convene an expert Task Force on Tree Health and Plant Biosecurity. I am prepared to consider radical proposals to protect the woodland environment and I look forward to seeing his interim proposals at the end of November. I will update the House when I have received that report.